I LOVE my summer Saturday ritual of visiting the Bronxville, NY Farmers’ Market! As the weeks progress, the offerings get more and more bountiful. This simple salad uses the summer staples found everywhere. Saute the corn kernels over medium high heat for a few minutes until crisp tender; season with salt and pepper. Blanch the green beans in a large pot of salted boiling water until crisp tender- about 5 minutes. Cut the beefsteak tomatoes into wedges. 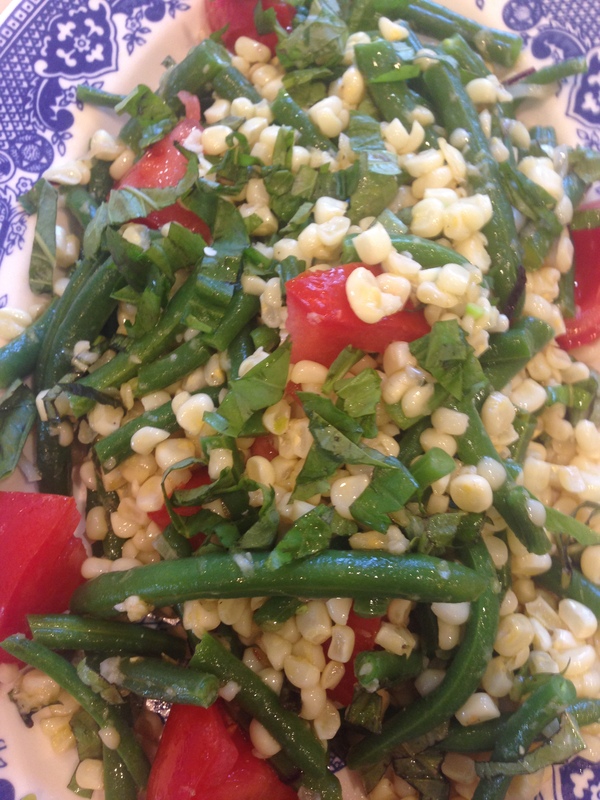 To assemble – gently toss the corn, beans, tomatoes and basil together on a large platter. Season to taste with salt, pepper, more olive oil and a splash of vinegar. Only add the vinegar right before you serve it to keep the beans from turning yellow. Posted on September 18, 2015 September 18, 2015 by nannetteiconnersPosted in Recipes, Savory RecipesTagged corn, food, green bean. Thank you- and it is simple. I hope you try it and enjoy it!